You don’t need to pay out for expensive personal trainers or pay for a costly gym membership when all you need for a well-toned upper body is a set of dumbbells, a gym mat and a bench. 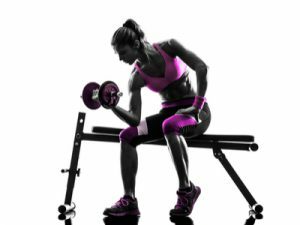 In our upperbody workout for women article, we will cover 4 of the best dumbbell exercises to help you achieve the upper body you have always wanted. You can also check out our Best Body Weight Exercises article for your 9 top toning bodyweight exercises to give your upper body the ultimate workout, no weights or bench needed. You can do the exercises on their own or you could add the dumbbell exercises in there too. Increased Metabolism – You Will Burn Calories Faster! One of the best reasons to train at home when it comes to your workouts has to be time. It’s bad enough waiting in traffic queues on your journey to work! Why waste any more of your precious time waiting in queues travelling to the gym. I worked out I spent nearly as much time driving to and back from the gym as I did the actual workout. Once you arrive at the gym it’s normally peak hours, everybody has to come after work and the gym is heaving, the weight rooms are packed full, and all the machines are taken. After 10 years of being a member of various commercial gyms, I decided I’d had enough and built my own gym. I’m not saying you need to build a large home gym. For beginners, I’d recommend buying a dumbbell set, a mat and a sturdy bench. See how you get along with training for the first 3-5 months, no point spending big if you are only going to lose interest soon after. But I’m sure once you see and feel the benefits of a regular weight training routine and healthy diet, you will wonder why you didn’t start earlier. One of, if not the most important part of any weight training routine is diet. 60% diet 40% training, you might be surprised diet is so important, but don’t be, your body needs a healthy well-balanced diet to make the most of the hard work you are putting into your training. Muscle is developed from high-quality proteins. You will want to limit your fat intake and increase protein intake and remember variety is key. Try and cut carbs too if you are overweight. Here’s an idea of some of the foods that will be very beneficial to your training diet. Did you know that weight training or any strength training that uses resistance(this includes bodyweight exercises) can help or even prevent the onset of osteoporosis. Studies have shown that weight training over a certain period of time can help prevent bone loss and could help create new bone. At any age in your life, it is a good time to start training. As we age our bone mass steadily decreases, especially post-menopausal women who are more likely to suffer from estrogen deficiency. Many studies, particularly of women in their 60s and 70s who took on a resistance training programme, showed vast improvement in bone density around hips and spinal area. Don’t make the mistake of waiting until you are older, start training now, it’s always better to prevent an illness than to cure it. But don’t worry if you’re starting training late in life, the outcome can only be positive. you will slowly start to increase your bone density. One of the most impressive benefits of weight training or any strength training programme is the afterburn effect. Once you start to turn all the no good fatty stuff inside into healthier muscle, your resting metabolic rate rises. This means after a single weight training session your body will continue burning calories up to 36 hours after a workout. Great news, even sitting on the couch watching the tv, your body is still burning the extra calories because of your raised metabolism. Muscle burns 10x the calories of fat- keep reminding yourself of that stat! Following a training routine will not only make you a lot fitter, burn fat and give you more muscle mass, it will also make you stronger. You will be stronger to deal with everyday tasks. Self-esteem improves as your body starts to change, and you will see the changes slowly taking place each time you look in the mirror, it will give you a real boost. lets take a look at the 4 dumbbell exercises to get your upper body toned and in shape. To start, a great pressing movement to create strength and balance in the shoulders. Secondary muscles worked: Pectorius major, Triceps brachii, Trapezius upper and lower. Pick up two dumbbells, using an overhand grip, sit down on an upright bench. Lift dumbbells to shoulder level and rotate your palms so they are facing forward. In a controlled fashion slowly push the dumbells upwards to an overhead position, until the dumbbells touch each other. Remember not to arch the back or lock elbows at the top of the movement. Slowly return the dumbbells to starting position and repeat. Another fantastic compound movement for building the chest muscles. What makes this such a great exercise is the fact it can be performed at various different angles, targeting all 3 major muscles of the chest. Sit on the edge of the bench and grab two dumbbells using an overhand grip. Bring both dumbbells to each side of your body at chest level. Slowly bend arms and lower the dumbbell to the side of your chest. Push the dumbbells from the side of your chest to your starting position, straighten arms completely at top of repetition. Keep movements slow and controlled. Working several muscles in your upper body including your lats traps and rear shoulder muscles. The dumbbell row is an awesome exercise for strengthening and thickening the back muscles. Grip a dumbbell with your right hand using an overhand grip. Bend at the hips and place your left knee on a flat bench. Keep your right foot on the floor and leg slightly flexed. Your upper body should almost be parallel to the floor. Keeping your elbow close to your shoulder, pull the dumbbell up towards your hip. Slowly lower the dumbbell in a controlled manner and repeat for the desired number of reps.
Switch side and repeat with another arm. Becoming ever more popular the tricep kickback is an easy and versatile movement that isolates the triceps. Extend your elbow to straighten the arm, by doing this you will push out the dumbbell behind you. Last words on form, never choose a weight that’s too heavy to carry out the exercise properly, if any weight is causing you to swing at all then it’s too heavy. Muscle gains will be slower and you will increase the risk of injury. Make sure to have a weight light enough you can carry out the desired amount of reps without jeopardizing your form. PreviousPork For Protein – Take A Break From Chicken! My sister had a new baby about 6months ago and she is looking to lose dome of the baby weight. However she can not get away to a gym. So some of the tip you have provided about getting in shape at home might help her out a lot. Before I share your site with her, I am wondering if you think it is to soon for her to begin working out since having her baby? She is in great health over all, I am just wondering if her body needs more time to recuperate? Hey Brendon. Yes, it is likely that your sister is physically ready to start a regular workout, but emotionally, maybe not. You might not know how draining it is to care for a baby! I suggest that you DON’T recommend she start a workout, because your remark might be construed as meaning she’s still fat. Rather, you can be a good example and do your simple workout at home and, as opportunity arises, tell her how good it’s been for you. Congratulations on your new niece or nephew! Thanks for a great article. I would never exercise if it meant I had to go to the gym- I’m lazy! And I work from home and have my baby home, so getting out alone is rather difficult. For a while now I have been thinking about taking on weights. Right now I can’t because I’m pregnant but it is definitely something I would like to do. You can save a lot of money and time training at home. I hope you manage to take it up after the pregnancy, thanks for dropping by and the kind comment. I am a huge fitness advocate and I am happy I read your article! Even though I am not a woman, most of this still holds true for guys like me. For example, foods like tuna, nuts, beans, etc. will improve my physique and overall health! Thank you, and I plan on coming back for more. Thanks Marques, I’m glad the post was of some use to you.